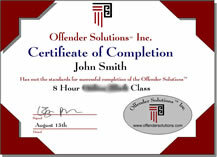 Offender Solutions® is a professional online education service for juveniles and adults. Our online classes are accepted by courts, schools and employers nationwide - Guaranteed! a) when an agency/referral source notifies Offender Solutions® that a person/client is required to complete an Offender Solutions® online class or workbook class, upon the request of the agency/referral source or the client, Offender Solutions® will notify said agency/referral source of the client's completion status and other relevant information. c) when requested by a verified referral source, Offender Solutions® will provide progress updates, including completion status regardless if participation in the Offender Solutions® class was by referral or elected by the client. Offender Solutions®, under most circumstances will provide any and all information demanded by a legally issued subpoena.